Talking about one of the most divisive films of the 1990s, as director David Fincher teamed with first-time feature cinematographer Jeff Cronenweth, ASC to craft a tale of modern disillusionment. Director David Fincher teams with first-time feature cinematographer Jeff Cronenweth to craft a tale of modern disillusionment in Fight Club. In his 1996 novel Fight Club, writer Chuck Palahniuk posed this question: What do you do when you realize the world is not destined to be your oyster, when you recognize the innocuous banalities of everyday life as nothing more than a severely loosened lid on a seething underworld cauldron of unchecked impulses and social atrocities? Director David Fincher is no stranger to this theme. All of his previous films, Alien3 (see AC July ‘92), Seven (AC Oct. ‘95) and The Game (AC Sept. ‘97), have explored the dark side of the human psyche. With Fight Club, Fincher once again demonstrates his affinity for this bleak and foreboding realm, displaying a deft cinematic sensibility and a gift for taut visual execution. Fight Club opens as its disenfranchised — and nameless — narrator (Edward Norton) feigns illness and begins attending cancer-patient support group meetings in a vain attempt to find purpose within his lonely, mundane existence. Through a chance encounter on an airplane, he meets the enigmatic Tyler Durden (Brad Pitt), the organizer of Fight Club, an underground group of young men who take part in bare-knuckle brawls concocted to vent their pre-apocalyptic angst. Fincher has worked with a score of prominent cinematographers on commercials, music videos and feature films. Interestingly, he began shooting Alien3 with the late Jordan Cronenweth, ASC — who left the production due to his battle with Parkinson’s disease, and was replaced by Alex Thomson, BSC. For Fight Club, Fincher enlisted Jordan’s son, Jeff Cronenweth [ASC], to realize his uniquely dystopian vision. 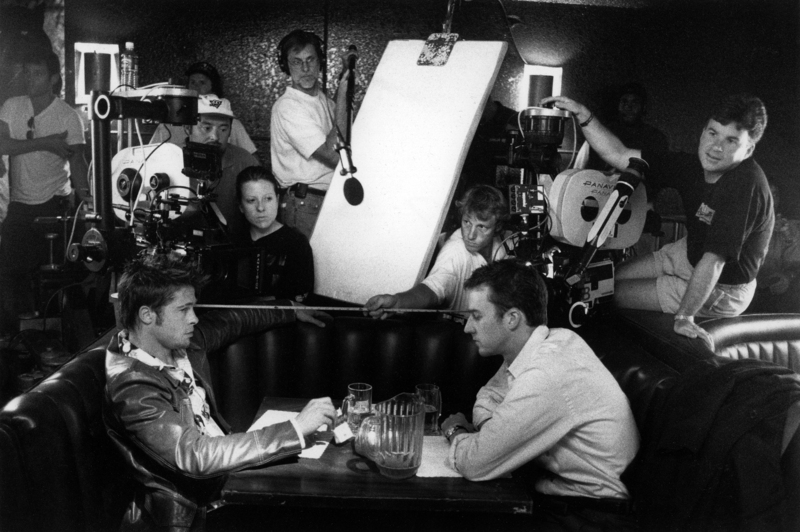 Cronenweth (wearing cap, just behind the camera on left) and his crew set up double coverage for a conversation scene between Tyler Durden (Brad Pitt) and the film’s nameless narrator (Edward Norton). Author Leonard ZeligPosted on April 18, 2019 April 18, 2019 Categories 1999. Fight ClubTags Cinematography, Jeff Cronenweth, Merrick Morton, Profile3 Comments on Anarchy in the U.S.A. 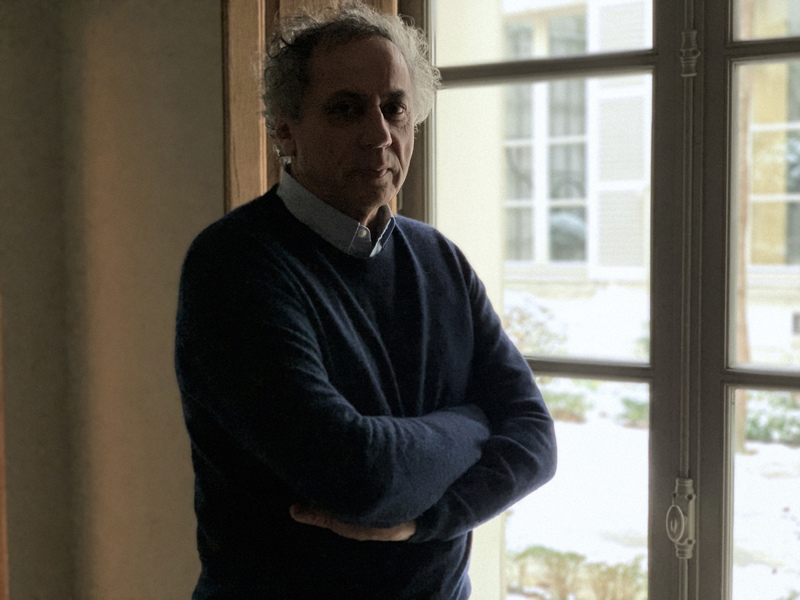 When I visit Darius Khondji, ASC, AFC, in his home in Paris recently for coffee, tea and talk about his art and craft, we speak in his dark living room, with a small pool of light from a lamp on a nearby table, and soft daylight coming through French windows that give on to a snowy courtyard. The esteemed ASC member reflects on his breakthrough feature Se7en, which helped change the face of Hollywood horror and suspense features and remains a cinematic touchstone. The following is an excerpt from the new book Conversations with Darius Khondji, written by The Hollywood Reporter film critic Jordan Mintzer and published in a French-English bilingual edition by Synecdoche in Paris. The excerpt is taken from the chapter “Out of the Shadows,” which begins with Khondji describing his work on David Fincher’s Se7en (1995) — the first feature he shot in Hollywood. Order the beautiful limited-edition hardcover book: Conversations with Darius Khondji, by Jordan Mintzer (Synecdoche, Paris). HIGHLY RECOMMENDED! Founded on January 8, 1919, the American Society of Cinematographers celebrates its 100th anniversary today. The 100 films list will serve as a library of influential, key titles that all cinematographers should see as well as an educational tool for students, teachers and film lovers to better understand and appreciate the importance of cinematography. “It is our hope that the list will help cinematography to be better understood by the public — the audience — [and to showcase] each of us as an artist who is an essential contributor to the magic of cinema,” offers Fierberg. The list represents a range of styles, eras and visual artistry, but, most importantly, it commemorates films that are inspirational or influential to ASC members and have exhibited enduring influence to generations of filmmakers. Members chose to frame this list around the 20th century to ensure that enough time has passed for the titles and work to reasonably exhibit enduring influence.